I just had my 85th birthday, which is a time for reflection and contemplation of the future. When you are 21, who in the devil thinks they will ever be 85, and if they do, what a calamity that must be! I certainly need to go on the offensive to avoid the “Old Fogey” label, and all of the stereotype perception that goes with it. I think I will start by upgrading my communication skills. You see I lived through an era where lots of “stuff happened.” It happened in my military career, student career, medical electronic design career, business career, automobile restoration hobby and writing career. “Stuff” just happens to everybody; there is no news in that. But I think I will start my communications upgrade with how I communicate about “stuff” that happens to me. In my younger years when stuff happened, I just acknowledged it, tried to evaluate the cause, and what could be done about. I mostly kept to my own council, but I sought council from others when it was advisable and available. I just did not see the need to spread the stuff around. However, now with the tremendous presence of internet communication, it is incumbent on me to broadcast my stuff for all the world to commiserate with me and to participate in how to manage the problem at hand. To do this, I need to upgrade my communication vocabulary to match modern expectations. For example: I am a professional engineer, which means that I have a certain educational background and have demonstrated proficiency in some area of engineering expertise. To just say that I am a “Professional Engineer” is no longer adequate. I must now say: “I am a highly accomplished professional engineer with superior education credentials who has world class knowledge and experience in the field of medical electronics, where I had a brilliant design career that garnered the attention of the outstanding leaders in both the medical profession and the business community.” So, let me use this very elevated background platform to restate how I now need to communicate about stuff in a manner to meet current internet communication expectations. When painting the door of my Chrysler, I thinned the paint too much. It was a mix of a little too much gun pressure, a little too slow gun movement, and the paint developed runs. I let it dry, sanded it down, and shot it again with the paint gun. Looks good now. I want to continue practicing upgrading my communication, so let’s jump into another scenario. I bled the replacement brakes on my Chrysler, and I did not close one bleed screw completely, which caused a loss of brake force. The car rolled down the driveway into the street before I could stop it with the emergency brake. My neighbor was driving down the street and stopped in time to avoid hitting the car. He helped me push the car back up the driveway. I will have to be more careful in the future. Well, first it was exploding air bags, and now it is defective brake cylinders. I had a huge problem when a brake cylinder failed to hold pressure, and the car uncontrollably sped down the driveway and into the street where my thoughtless neighbor just missed hitting it. At least he had the decency to help me push it back up the driveway. He knows that I do car restorations and thus can expect problems to occur. I think he should really be a little more considerate and drive down the next street. I took my car to a national meet, where it was carefully judged for restoration quality and accuracy. The judges noticed a few areas that were incorrect and needed improvement. I will take care of those before the next meet. 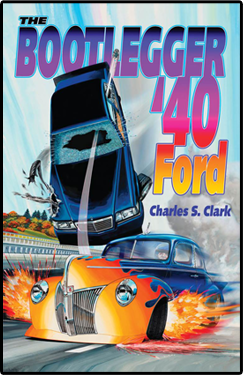 This article was published in Bootlegger Book Blog and tagged 40 Ford, car restoration, Charles Clark, hashtags for cars, hot rodders, hot rods.